Courtney J. Cook, a company member with Urban Bush Women, will be spending a lot of time at BRIC this year. She is also a part of our BRIClab program this spring with the show FLUẊẊ Part 2 (work-in-progress). Learn more about Courtney and get tickets today to see Hair & Other Stories, which will have its New York Premiere at BRIC January 31-February 9. What is your earliest movement memory? My earliest movement memory is seeing my Mom and Elder Women “shout” in church. I was probably 4 years old. I soon started to mimic them and would often jump up and down in the pews during praise break. When did you start dancing with UBW and what drew you to the company? I started dancing with UBW the summer of 2013. I was first introduced to the company as a senior attending Virginia Commonwealth University (VCU). UBW came and set “Shelter” on a group of us. I was moved and captivated by the process, which included rigorous research, building trust among the group, and digging into our own personal narratives and histories. 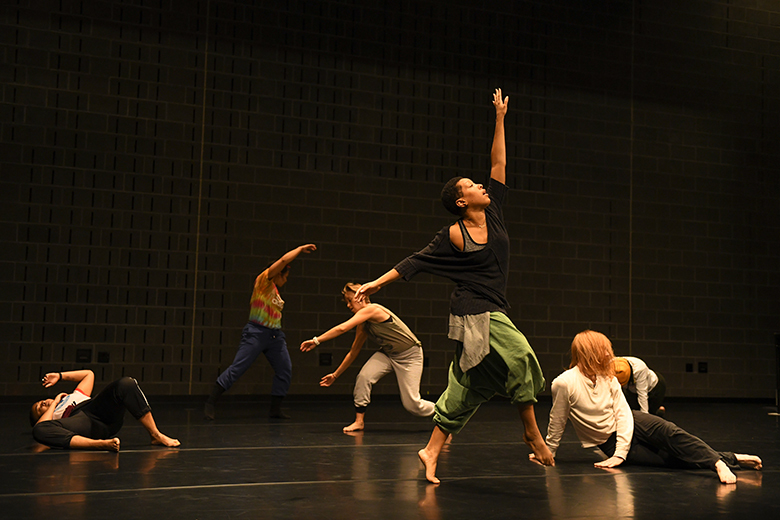 We got beyond the step in both a felt and analytical way, which was different from any other choreographic process I had experienced at the time. It pushed me in ways I had never been pushed. I saw growth not only as a dancer, but as a community leader and organizer. It was a very self-validating and humanizing experience for me. I knew I wanted more of that. What is your relationship to hair? It’s mine. It’s been with me all my life. It’s been a part of my daily ritual, rites of passage, and cultural identity. I’ve been in love with it; I’ve hated it; I’ve been ashamed of it. It has prohibited me from having access to certain institutional privileges. I learned to change it, code switch, assimilate, fit in. I damaged it. Damaged it for jobs, for success, for privileges, for boyfriends, for love, for acceptance, for validation. I cut it. I reclaimed it. I've accepted it. I love it. I value it. It taught me patience, endurance, how to sculpt and craft with my hands. It taught me art. It taught me how to be a chemist. Alchemy. Physics. Gravity defying swagger. Culturally defining me. How I wear it, I get to decide. Some of it you get to see on my head and some of it is within. Unseen. Rooted. Dark brown. Black. Beautiful. My relationship with my hair is a reflection of my relationship to myself. I am my hair. What are you most excited about for this performance? I’m most excited about the work being in Brooklyn. We’ve really been in the lab, digging, investigating, and working hard to develop work that pushes both us and the audience in how we are understanding and unpacking larger issues affecting the community. It feels more like a conversation because the audience or viewers are as much involved in the “performance” as we are. I’m excited about that conversation happening in Brooklyn because it has been my home now for six years and a home to UBW since ‘84. That relationship to our community is such a key component to our practice as organizers. I’m looking forward to being with our Brooklyn Family and the energy and brilliance they bring!! What do you hope the audience takes away from the show? I believe that the audience will leave the show energized to continue the conversation with their loved ones and communities. I hope to plant seeds that we will all nurture, dig, plow, water, and allow to bloom. I want us all walking away with a clearer understanding of our own power and capacity to act, have our hands in the soil, to shift power and change policy.